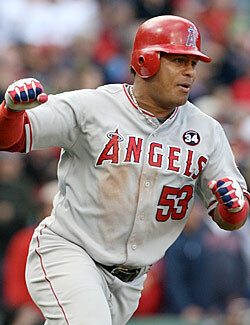 When the ALDS ended, Angels manager Mike Scioscia referred to Bobby Abreu as the Angels' MVP this season. On first glance, this is a strange statement: Three qualified Angels had more home runs, two had a higher OPS, four had a higher batting average, and someone topped Abreu in RBI and OBP, too. But having watched Abreu for two and a half years in New York, we know what he meant. Yet he never really distinguished himself in New York. He wasn't unpopular, but wasn't particularly a fan favorite, either. We always thought of him as something of a throwback to the late-nineties teams — someone you could pencil into the same position and the same spot in the batting order, every night. (You'll recall that this wasn't the case at several positions the last couple of years.) When it became clear the Yankees wouldn't be bringing him back, there wasn't much of an outcry, even if it meant a season of the inferior Xavier Nady in right. Abreu's 35 now, and had a $16 million option for this season, so it wasn't surprising that the Yankees declined it. But thanks to a weak free-agent market over the winter, the Angels stole Abreu for this season for just $5 million. For a comparison, that's less than the Yanks are paying their own bad defensive right-fielder, Nick Swisher. (And while Swisher is a great on-base guy, Abreu is better.) Abreu never struck us as vindictive, but we're sure he'd like to have an especially good series against the Yankees, who spent money this winter like it grew on trees, except when it came to him. That, and so he can cash in, one more time, after the season.